It's now seven months since Gibson launched the Firebird X at New York's Hard Rock Café with an Apple-style fanfare and Gibson Chairman and CEO Henry Juszkiewicz declaring, "This is new. This is different. This is revolution. Nobody looks and spends the time to reinvent the guitar. This is a new guitar." Although the $5570 Firebird X was available to pick up and play earlier this month on the Gibson stand at Frankfurt Musikmesse, according to an announcement on Gibson.com, after a number of false starts, shipping has now been postponed again, with an updated release date for the guitar due "shortly". "Everyone at Gibson is absolutely committed to making sure that when we ship the Firebird X it is the world's ultimate guitar." The official word is as follows: "After a very successful performance and some great consumer feedback at last week's European debut of the Firebird X at Musikmesse in Germany, Gibson is taking advantage of the unlimited capabilities of the instrument and is exploring additional functionality on the guitar suggested by players and dealers. "This will delay shipment, but everyone at Gibson is absolutely committed to making sure that when we ship the Firebird X it is the world's ultimate guitar. Stay tuned at Gibson.com, where we will post an updated release date shortly." Of course, the (white?) elephant in the room is that many of you might be wondering if this rare 'bird will ever see the light of day at all. 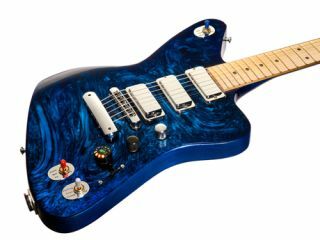 Given the hype, and the significant price tag, we have to assume that Gibson is under considerable pressure to make a success of the Firebird X on a retail level. Surely it would be unthinkable for the company to brush the product under the carpet and pretend that it never existed, wouldn't it? Stay tuned to MusicRadar for the latest on the ongoing saga of the Firebird X.